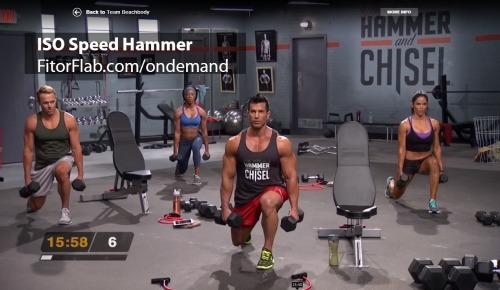 ISO Speed Hammer is a workout that’s included with The Master’s Hammer and Chisel fitness program Beachbody. The full program is available in December 2015. Created by Sagi Kalev and Autumn Calabrese, this 60-day program is designed to shed body fat and get ripped. Available now at Beachbody On Demand Total Body Chisel and ISO Speed Hammer. Get your 30-day FREE trial membership NOW! What is The Master’s Hammer and Chisel Fitness Program? You can create powerful muscles as well as strength with the new Hammer and Chisel workout from Beachbody! Check out the sneak peek workouts now at Beachbody On Demand! – Only if you are ready to shed body fat and build a ripped physique! I was so excited to ISO Speed Hammer available in Beachbody on Demand! I waited two days to do the ISO workout since I was super sore from the Total Body Chisel workout! Although ISO Speed Hammer is only about 24 minutes long, it was pretty tough but I stuck with it! Pullup bar or resistance bands door attachement. Sagi started the ISO Speed Hammer workout with a good warmup that is performed with the resistance bands. OK, it was a challenge! But I got a great upper body stretch! What I experienced next was unexpected! Oh my gosh! Eleven exercises that you do for 20 reps. The first 10 reps are done in 3 slower steps in one direction and a quick step the other direction. Then…you continue with 10 super fast reps! OK, I survived but I did use light weights since it was my first time! Check out my ISO Speed Hammer video review here with snippets of the workout! Overall the ISO Speed Hammer workout was awesome! I was super sore the next day and felt like I got a great workout! I can’t wait for the full Master’s Hammer and Chisel workout. Get ready to create the body you always wanted with The Master’s Hammer and Chisel. Exclusive sneak peek Total Body Chisel and ISO Speed Hammer workouts are now available on Beachbody On Demand, so log on now to begin!